Busy, busy, the sun is shining and it’s a bright new year. I have high hopes for 2019, my New Year’s resolution is in full swing. I decided that Wednesday is Ginny’s Jungle day, I cannot really expect to make a go of my local events business if I don’t put the effort into it, by effort, I mean time and money :). This Wednesday I got to grips with lots of things that I have been putting off for ages, arranging advertising, writing letters to send out to schools. I mean ‘writing’ on the computer, not by hand, imagine how long that would take! However, I intend to print the letters and put them in the post, enclosing a Ginny’s Jungle leaflet. I think it is much more likely to be noticed and hopefully read than just sending an email. One of my better ideas was to inform people of the day that I will be sending their order. It works really well as it gives people the chance to change the day if necessary. It does of course mean that I don’t post orders on the day I receive them, unless it has been arranged in advance. I generally post on a Monday and Thursday, these days are pretty much set now unless something comes up and I cannot post on one of those days. To be honest I don’t receive enough orders to warrant posting on a third day and if I were to post on three days a week I’m not sure how I would fit the rest of my work in. 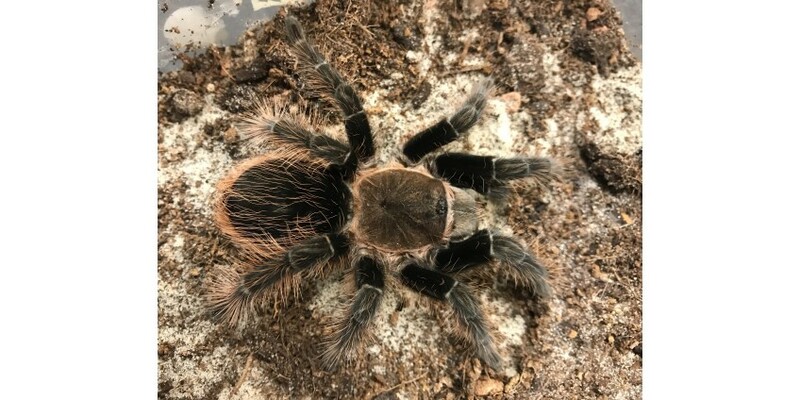 I’m glad I have managed to clear some of my tarantulas as I have a large number coming in at the end of the month, lots of new and colourful species I hope. Mind you I did take in some spiders this week from a lovely guy who sadly could no longer keep them. One is a Mexican Red Knee which he thinks is a sub-adult male. I think he’s right and I will be happy with that as my pet Red Knees are both adult females! Another is an adult female Chile Rose, very useful for my Ginny’s Jungle events and lastly a Brachypelma spider that looks like a Curly Hair but has striking red hairs on the abdomen. I am most confused, is it a hybrid I wonder? I will put a photo on here and perhaps someone will know. Must get a move on now, I am writing this on Thursday evening as I will be too busy in the morning but my poor husband has come in from walking Teddi and I was supposed to be making dinner but I didn’t get very far, oops. He’s been very patient but I must admit I’m pretty hungry too, my tummy is rumbling so I’m off! Hope everyone has a nice weekend, I’m not keen on this cold snap, I might hibernate indoors this weekend.